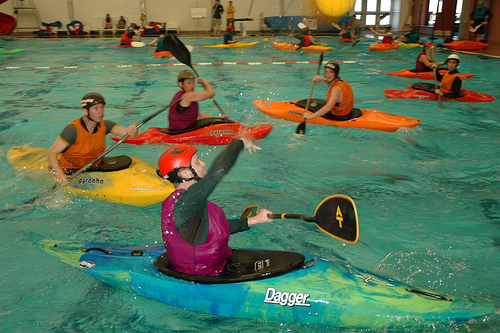 Kayak Polo is one of the best skills-building games for whitewater, and can be played year-around. Kayak Polo is played competitively in most countries around the world, and may soon be an Olympic sport. Many paddling clubs, universities and paddling schools around the country play a recreational version of kayak polo, that is mostly social and for skills-building, but many play competitively. Two teams of 5 players attempt to shoot a water-polo ball through goals at either end of the playing field. Paddles may be used to block passes, shots on goal or to dribble the ball down-field. More competitive versions allow for a defender to "tackle" the person with the ball, by either pushing with hand to shoulder, or "boat tackle" where the defender nudges or pushes the offender's boat with their boat. Recreational leagues typically disallow tackling or make exceptions for less experienced players. At a minimum, players should be comfortable performing a wet-exit. Ideally, players should strive to roll their kayak with their paddle, and ultimately be able to hand-roll, without a paddle. Paddlers may also attempt a Hand-of-God rescue or Bow-rescue. Each of these rescues are commonly used in whitewater and kayak polo gives paddlers plenty of practice! Paddles are optional for kids and adults. Kids often enjoy playing kayak polo much more like basketball, where they simply pass the ball down-field, and shoot for the goal.